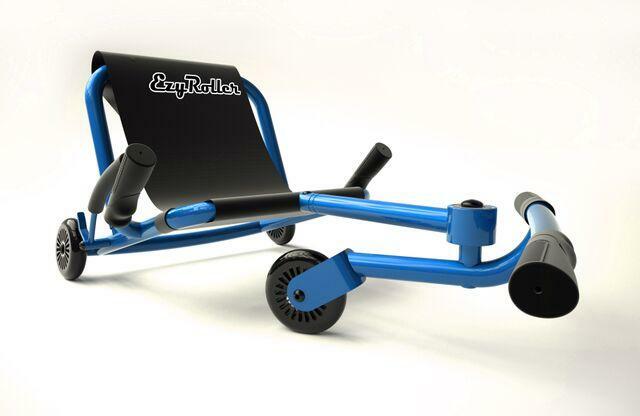 EzyRoller combines the control of a bike and the fun of a scooter, yet it's very unique, like no other ride you've ever had. It moves like a snake, without chains or pedals, using easy right-left leg movements. There are no chains or batteries - the EzyRoller moves and turns silently. It offers the enjoyment of new locomotion possibilities that can't be experienced on any other bike or ride-on. Just Sit comfortably with your back firmly against the back of the seat, put your feet on the push bar, push on your right foot and then your left to advance your EzyRoller forward. You turn using your feet. Comes unassembled. Easy assembly requiring adult supervision; all tools and parts included in the box. Designed to be used on flat/smooth surfaces indoor and outdoor. It is not designed for slopes, down hills, jumps, uneven surfaces, grass or sand. Using the brake on slopes can damage the wheels. Weight limit: 150 lb. Dimensions: L: 28" - 41" x W: 17.6" x H: 13.5"